Last week I made the teriyaki meatballs recipe that can be found in Yum-Yum Bento Box and used half hamburger and half turkey in an attempt to make it healthier. I wasn’t all that happy with the results. I mean, they still tasted good, but if you’ve ever had ground turkey before, you’d know that there’s a distinct taste to it and it didn’t really mesh too well in this recipe for some reason. I know turkey tastes good with teriyaki because I’ve made Teriyaki Turkey Burgers before and they tasted amazing. When frying the meatballs, they had a pretty dark crust on some sides, but this basically gets “erased” by the soaking in the sauce so they look pretty good for bento. 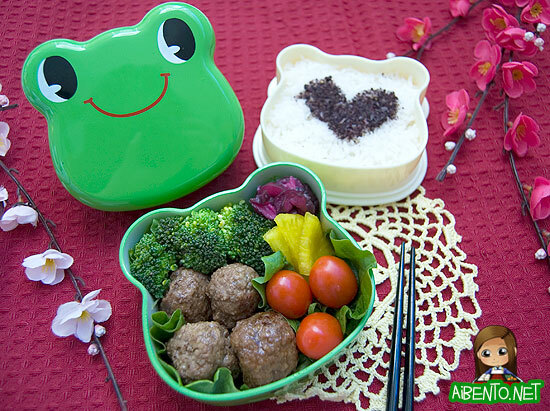 I think this frog bento box is from J-List, but they’re out of stock. Amazon and AllThingsForSale sell an identical one with a different frog face. In the bottom tier I put broccoli, meatballs, takuan, three grape tomatoes from Mr. Pikko’s growbed, and some eggplant pickles. In the other tier I padded the rice down flat and then sprinkled yukari powder with a heart stencil. It’s actually the first time I’ve used these stencils and I had a hard time finding them, haha! They came with my sets of charaben cutters. My Journey to "The Island"